As this year’s Winter sports season come to an end, the Girls Varsity basketball team once again, bring home the glorious, shining title of league champions. The varsity team, led by head coach, Julian Anderson and Assistant coach, Mark Kitabayashi, has been the prevailing champion for the past five years. This continuous triumph sprouts from the solid foundation based on perseverance, determination, diligence, and discipline. Their steep climb to this spectacular journey of success first started on a an early morning when the culver girls defeated a notorious Morningside High School. Since then, the Varsity team was never the same. Every year after that, the girls came out strong in every league season and were determined to crush any team that threatened their victory. But no competitions compare to their latest, a fierce battle fought on pur very own grounds of Culver City High School. This year’s Varsity team consisted of an almost entirely fresh batch of girls. After the five experienced seniors left the team last year, there were only two remaining currently experienced seniors that have been playing for the varsity team since freshmen year, Kailey Tooke and Kate Suyetsugu. Along with that, there were two other returning players, Jazzmine Lacey (senior) and Alexis Arancibia (senior) who experienced only limited action last year. The last two returning players, Hayley Yamamoto (sophomore) and Huma Manjra (sophomore), were coming back with only half a season of Varsity experience as they were moved up mid-season from the JV team last year. The fresh batch of girls were made up of three freshmen, Amy Yoon, Heaven Cooper, and Shelby Montez, two sophomores, Angel Morris and Lauren Jones, and one Junior, a transfer from Venice high school, Windy Yoon. As they struggled to work together, this extremely young team faced many challenges and started off with a rocky preseason. The main struggle lied in the general maturity level, or rather, lack thereof. Neither Coach Anderson and Kitabayashi had ever dealt with an immaturity problem. The teams lack of maturity and inability to focus made it extremely hard for the girls to collectively meet the coach’s specific expectations and standards, but also to perform cooperatively together. According to head coach Julian Anderson, the new girls “weren’t used to the rigorous work and expectations both Mark and I expect”. The iron foundation that had been built and progressed on for years, was now slowly disintegrating. These girls were just not ready to perform at the expected level and accomplish the tough work that was presumed (Kitabayashi). However despite all the obstacles presented, the girls fiercely fought their way through the difficult season and no one was more surprised when the girls miraculously returned with a victory for Culver High. The girls started off their ocean league season with an easy victory in their first game against Lawndale High school, where they finished with a strong 23 point lead. 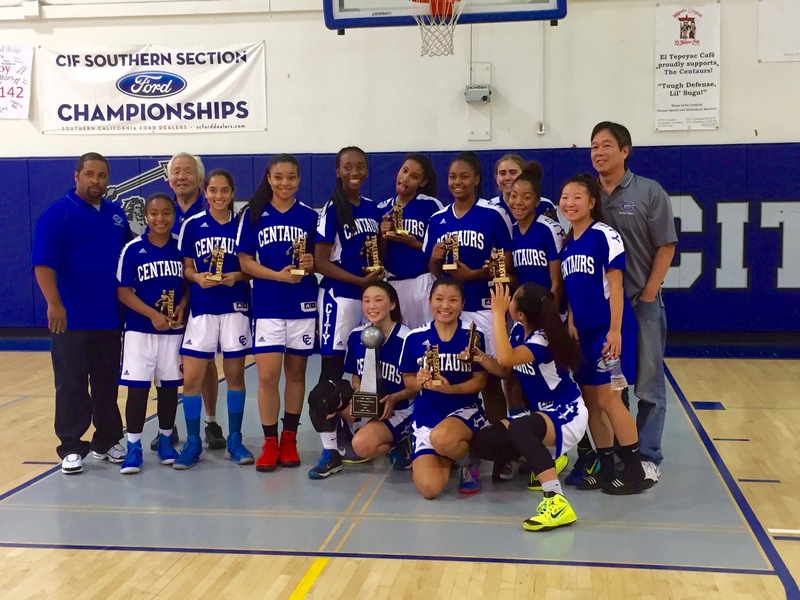 However, this success was quickly shot down as the lady centaurs suffered a tough defeat against El Segundo. This loss broke their 41-0 streak, and the lady centaurs were forced to surrender the first place title. Despite this disappointing setback, the centaurs were determined to rise up and crush the El Segundo Eagles. So when the second game against the Eagles rolled around, the Ladies were out for Eagle blood. The girls not only defeated every other team in their league, but after a suspenseful game against El Segundo, snatched the victory with a final score of 55-43. Previously, Lawndale had beaten El Segundo, which placed El Segundo at a tie with Culver, each team having one loss. Luckily, the Centaur’s recent victory against the eagles placed them back in the lead. After smashing the final team (Beverly Hills High School) by a whopping 39 points, the centaurs were officially the league champions of the 2015-2016 ocean league season. As the lady Centaurs advanced onto the first round of Division I AA Playoffs, they diligently pulled off a win against Arcadia high school (62-40). The second game of the Playoffs– a game against Millikan High School is remembered to be the most epic and spectacular comeback. Facing a challenging first half, the lady centaurs were down by 15 points at half time. As the third and fourth quarter approached, the centaurs regained their courage and rose up fiercely to crush the other team. Senior Kailey Tooke scored an unbelievable 46 points. Picking up the slack, the team began to add onto these efforts. This unexpected comeback threw the Arcadians off, allowing Culver to steal the win. The final score glowed on the scoreboard: 72-69. With an eruption of cheers and whoops, the starry eyed Centaurs were on their way to round 3. The Lady Centaurs were matched against a tough Redondo High School.What started as a back-to-back score game slowly dwindled down to Redondo in the lead while the lady centaurs ran out of steam. The lady centaurs faced an utter defeat that brought an end to their season. Despite this partial loss, the girls are still shocked and proud of their amazing accomplishment. Now looking back, a year ago these 12 girls walked on the court ready to form a fellowship. A year ago, they assembled as a single unit with hardly any experience. A year ago, they could have never predicted that they would reign together. Now, they walk away with a better sense of self and leave the courts with a fight so powerful and a roar so empowering and raging. Partly due to this outcome is the way that these girls have grown over time and overcame their immaturity (Julian Anderson). When asked about this achievement, Kitabayashi proudly says, ” This success feels extremely satisfying and it’s a big accomplishment”. Kitabayashi credits the girls for their growth and says that, if you have a group of girls that are determined to learn, have the heart to play, and the perseverance to go though the rigorous program, then at the end of the day, that’s all you really need.